Renovating Rundown House Perth – Big structural work is almost completed but the fiddly bits – windows, louvres and DIY mishaps – are keeping us busy. You know, sometimes there are reasons why builders try to keep owners away from the property. About a week ago, as soon as Jeff and the gang left on the Friday arvo, Frank and I went into the house and tried to do a little DIY job. We thought we’d save money, but after two hours, we realised it was going to cost a fortune for Jeff to fix our mistake. We’d got to the stage where all the electrical have been installed, the wall joints were completed, the insulation was put in, and the gyprock was about to be added. At that point, we decided to strip the old wallpaper in our bedroom. It had quite a nice retro feel with silver circles, but there were a lot of rips and stains. So Frank and I arrived and started stripping it off. But the more we kept stripping, we realised we were also removing the gyprock. I’m not sure what sort of wallpaper glue they used in the mid-’60s, but it felt like Araldite. We kept making holes, tears and scratches in the walls. After a couple of hours, we realised we had made a huge mistake. We tried to spackle it, but didn’t have the skills to make the walls smooth. It looked awful, and we knew we’d have to turn to Jeff to fix our mess. We told Jeff when he arrived on Monday, and I felt like I was called into the headmaster’s office. I’m sure he wanted to give us a detention – but instead, he just rolled his eyes. 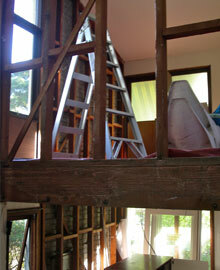 The main bedroom is directly above the living area. Now that the original gyprock has been removed, it was a strange perspective – looking directly at both rooms with no walls. At least we got the timing right – Jeff had new gyprock added within a few days, and we promised we’d never do any DIY work again. Apart from that little debacle, everything has been running pretty smoothly. 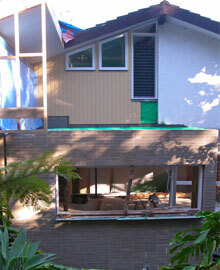 The extension – the kitchen and playroom – has been built, and the exterior brick wall has been laid. I’m really happy with the look of it. I’d like to take the credit but, to be honest, it was Jeff who came up with the funky slim-line bricks. But it was my idea to add tongue-and-groove timber cladding on the back exterior on the first floor. Behind it is the new bathroom with the new windows. On the right, the louvred window is in Sam’s bedroom. The original window was replaced to take away the temptation for him to climb out onto the kitchen roof. And, naturally, if Sam had done that, Ella would have followed. It was only later that we discovered there’s an attachment that stops windows from being opened wide enough for kids to slip out. Oh well, I love the look of the louvres and no-one can escape. 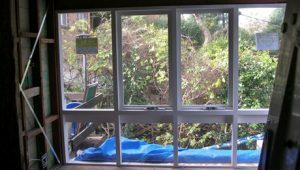 In all the other rooms, such as the new home office, we’ve replaced the old hinged windows with new frames and glass. We’ve followed the original style to continue that beautiful mid-century feel. The original glass was so thin, a simple bump could create horrible jagged glass. It was too dangerous not to replace. 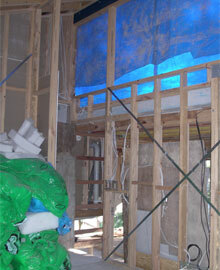 We’re also adding louvred windows in the new playroom – the blue tarp is being used at the moment until they’re installed. We had a slight problem due to the state’s environmental guideline. Since the orientation is west, we needed eaves for shading and for the glass to be glazed. I didn’t want the room to be dark, so I spent time searching for another option – I eventually discovered a film on the glass that allows dappled light to come through. I’ve seen one with a striped effect, and another that is rippled so I’m still deciding what to go for. I’ve found that these fiddly bits are time-consuming – it takes quite a bit of research – but I reckon it’s all these little elements that will make the house a real home.